SMB for the Title, Ginebra Looking To Stay Alive in Game 5! PBA – Two teams are in different mission in today’s game in Game 5 of the PBA Philippine Cup Finals best of seven series. San Miguel Beermen looking to end the series and claim their third straight Philippine Cup titles or the “Bernardino Trophy” while the Gin Kings will try to extend the series and fight another day. The Beermen, has completely dominated the Gin Kings in Game 1, Game 3 and Game 4 throughout the series. SMB has an averaged winning margin of double digit a game in 3 wins against Ginebra, while the Gin Kings only win in Game 2, that went down in the overtime period almost cost them to losses the Game after blowing a 26 point deficit and find themselves trailing in the last second of the regulation but thanks to Joe Devance clutch basket that saves the team from losing and eventually won in OT. The Gin Kings have already faced this kind of situation where they are trailing in the series and in a Do or Die situation. 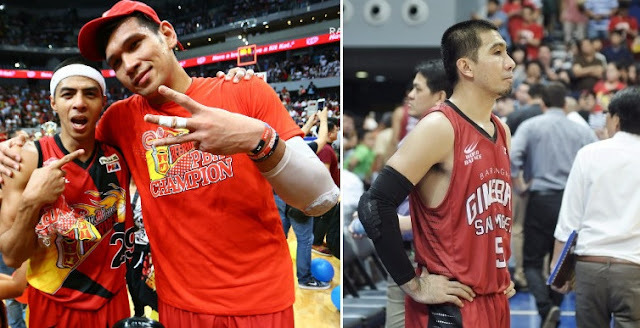 Just like in their semi-final series against the Purefoods Star Hotshots, The King is down 2 wins and 3 losses in a best of seven series, but conquered the Hotshots in Game 6 and 7 that brought them in the Philippine Cup Finals. Will the Kings do it again? JunMar Fajardo, Arwin Santos, Chris Ross, Marcio Lassiter and Alex Cabagnot will lead again the Beermen in Game 5 while the Kings will defend once again in their star player Japeth Aguilar, LA Tenorio, Sol Mercado and Joe Devance. Game 5 is scheduled today, Sunday 6:30pm at the Smart Araneta Coliseum and expected to be another thrilling game that Gin Kings fans will fill the coliseum to support the most popular team in PBA History. No Comment to " SMB for the Title, Ginebra Looking To Stay Alive in Game 5! "